Congratulations to the boys from Mission Trails on a great All-Star season! Congratulations to the Mission Trails Juniors All-Stars for winning the championship and taking the flag for Section 6! They beat the University City team to sweep the Sectional tournament. They next played in the Sub-Division tournament in Corona and were eliminated after two games. 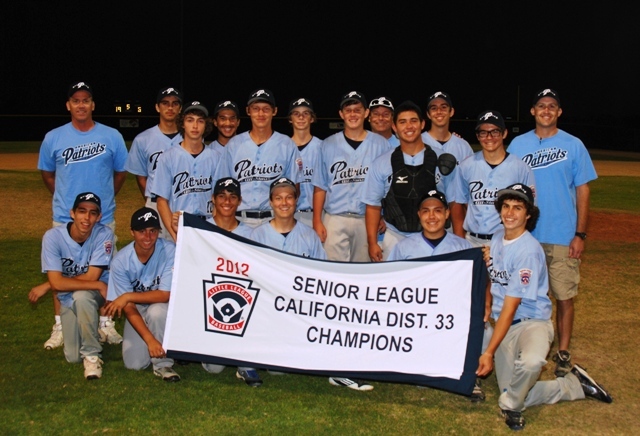 Previously, the Mission Trails team had won the District 33 Juniors title with a win over Rolando. They finished that tournament with a 4-0 record. Congratulations to the 2010 Patriot Baseball Seniors All-Star teams! The American League team consists of players from Allied Gardens and Mission Trails. The National League team is built from players in Lake Murray and San Carlos. The Patriot Baseball Board would like to congratulate the 2010 Patriot Baseball All-Stars. Good luck to all four teams! 2009 Mission Trails Junior All Stars "District 33 Champs"
2008 Patriot Senior National All Stars "District 33 & Sectional Champs"
Patriot Mission Trails Juniors had a great run in the All-Star tournament, but sadly it came to an end in the final game in the Sectional Tournament in Oceanside (7/22/09). After fighting their way out of the loser's bracket by winning their 5th game in as many days, the MT team lost in the championship game to Oceanside National, who advanced to the Sub-Division Tournament (played at Murphy Canyon Little League). 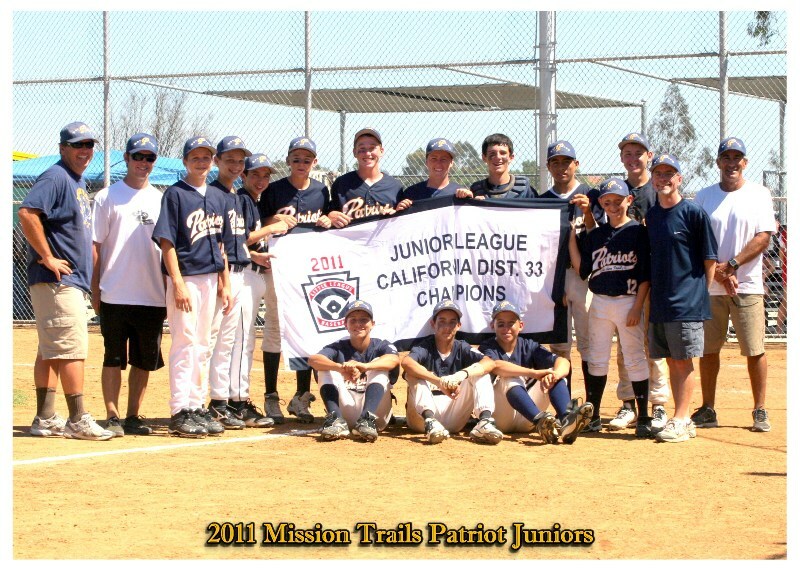 Congratulations to the Patriot Mission Trails Junior All-Stars, District 33 All-Star Champions! 2007 San Carlos "Senior" All Stars - "District 33, Sectional & Divisional Champs"
Regional Play: SC 10 - Nevada 5; SC 6 - Washington 4; SC 15 - Montana 1; SC 0 - Arizona 2 Final Media News Release 8/18/07 The 5 Tournament Levels. 2007 Mission Trails "Junior" All Stars -- "District 33 Champs"
District Play: Mission Trails 16 - Allied Gardens 3; MT 17 - La Mesa\Rolando 0; MT 15 - Tierrasanta 2; MT 5 - San Carlos 3; MT 3 - SC 2. Sectional Play: MT 8 - Oceanside Valley 2; MT 0 - Carmel Valley Ranch 12; MT 8 - Oceanside Valley 5; MT 5 - CMR 7. The post season ended with a lost to Carmel Mountain Ranch in the final game of the Section 6 playoffs. San Carlos 2006 Junior All Stars - "District 33 & Sectional Champs"
Players: Brydon Barr, Junior Cuevas, Myles Dempsey, Michael Juhnke, Andrew Katz, Dayne Knudson, Chris, Koury, Matthew Kucharski, Jordan McLaughlin, Derek Montoro, Trey Thompson, Devon Wells & Josh Wolfson. 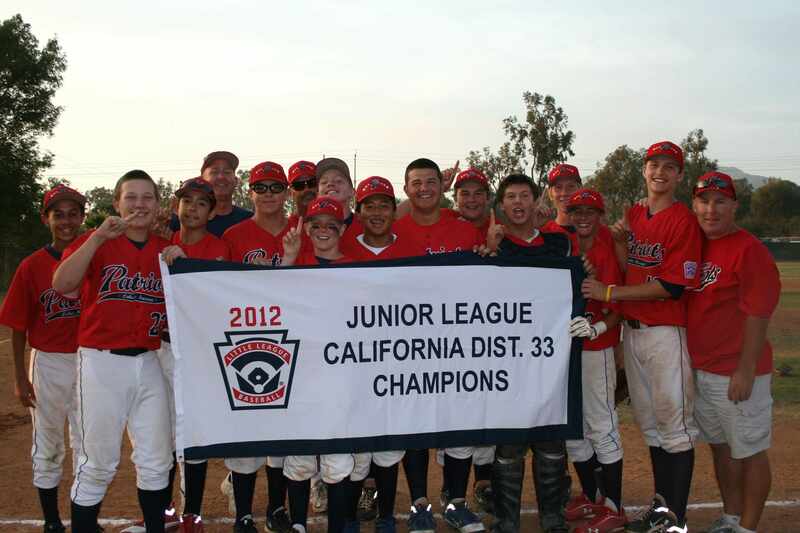 After winning the 2006 Junior Section 4 Tournament they advanced to the Southern California Division (State) Championship games, that started in San Diego on Saturday, July 22nd. The road to the World Series ended for the San Carlos Patriot team on July 27th when they came up short in the Divisional Championship game against Mission Viejo. Allied Gardens 2006 Senior All Stars - "District 33 & Sectional Champs"
Players: Shane Cerney, Bill Dabbert, Shane Farias, Sean Hatch, Joey Labbate, Landon Lessem, Nick Nobles, Zach Pettiford, Mario Sanfilippo, Justin Smith, Tyler Ziemba & Nick Brklycica. Allied Gardens Patriot Seniors won the Section 4 Championship Game on July 16th 7-2 over District 28. The AG Seniors traveled to Palmdale, CA for the Southern California Division (State) Championship Tournament where they were eliminated from the Divisional tournament on Sunday July 23rd.